If you have landed on this page and you are requiring an air test, check out the rest of our website and feel free to give us a call. One of the best decisions we made was to call ourselves Northern Air Tightness Testing Services Ltd, especially the Northern bit. When we started the company, we thought our main catchment area would be predominately Yorkshire and the North East of England. However, we couldn’t have been more wrong. As our reputation for excellence grew, so did the area we cover and we now find ourselves travelling down to just north of London, up to the Scottish Boarders and anywhere in between. We have, month on month got busier, to the point where four of us are out testing on a daily basis. We have therefore had to redefine what we think of as the north and think like those that live ‘down south’ So anything north of the Watford Gap is now the north. The fact that we are now very busy has not detracted from high standards of service. Whoever, attends to carry out your air test, be it Marc, Adam, Phil or Mike we will work in exactly the same way. Someone once described this to me as the McDonald’s approach, which I suppose they have a point but it works. So why Air Tightness Testing Staffordshire as a title? Well of all the areas we cover we have very little work in the Staffordshire area, which is a shame as it is my county of birth (home town Cheadle). We have a booking this week in Stoke with an existing customer of ours who suggested we target this area. He has repeatedly used our services and praised our support and ongoing advice we give him. This has included our free Air Test Check List which he prints out and has a copy pined to his site cabin. He also issues one to each of his sub contractors prior to them starting work. He describes this as a way of ‘concentrating their minds, in relation to the air tightness regime of the build. He even insists that the plastering contractors quote for a ‘solid dot and dab’ to each board IE as a minimum, solid line of bond to the bottom of each board. (Best practice is to picture frame each board with adhesive and then dot and dab the middle). He then tells them that the air testers will know if this is not done, ‘which is actually correct’. So why picture frame each board? Well in a nutshell on a traditional stone/brick, block, plasterboard construction, the plasterboard is the air tight barrier and any penetration in the plasterboard will leak. Most people think that this means down lighters and sockets and they are correct, however, what is often overlooked is the bottom of the plasterboard where it falls short of the floor. This area is generally finished of with skirting boards but behind kitchen units and baths it is often left unfinished. 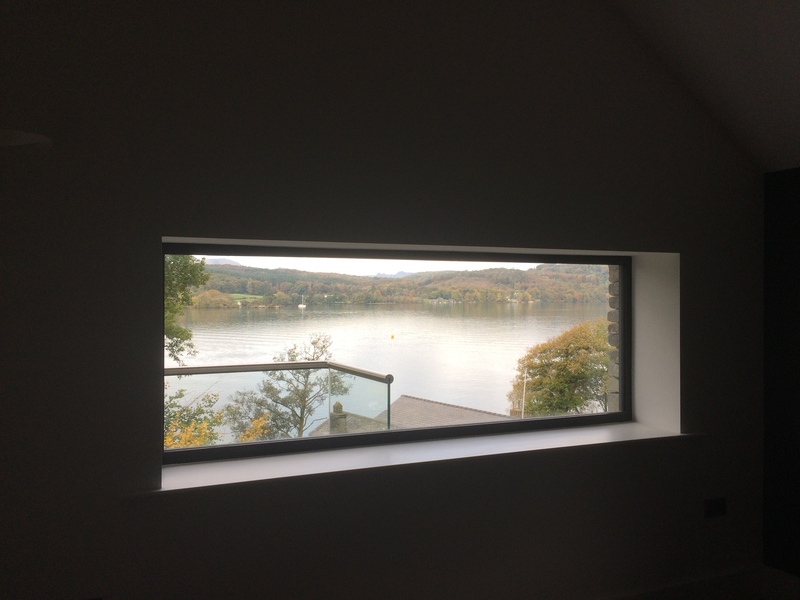 We highlight this in our check list, however, if the plasterboard has been picture framed this dramatically reduces air leakage from the bottom of the boards. (Check out the check list on our web page). However, please do not rely on the skirting to give an air tight seal as air will still escape from the bottom. If you think about the small gap at the bottom of your skirting board and then multiply that gap by the total of its length it will equate to a large hole. So basically you should not worry about sockets and down lighter. If you have been careful with the boarding out then the small amount of leakage from these areas will make little difference to the final score. However, for sockets the plasterer should have done a picture frame of bond around the perimeter of each socket cut out. As far as down lighters go, always use the sealed units rather than the open bulb type, especially if you are using a lot of down lighters throughout the property. Download our check list, print it off and display in prominently in the site cabin or the plot. Ensure that everyone working on site is aware of the air tightness regime. Ring us for advice, its free. To optimise our SEO we need to use the Air Tightness Testing Staffordshire at least three times in this post. Northern Air Testing is an ATMA authorised air testing company. Northern Air Testing Services have been trading for eight years now and have been a limited company for the past two and a half years. We are experienced in carrying out air air testing for both individual builders/developers and large national companies. 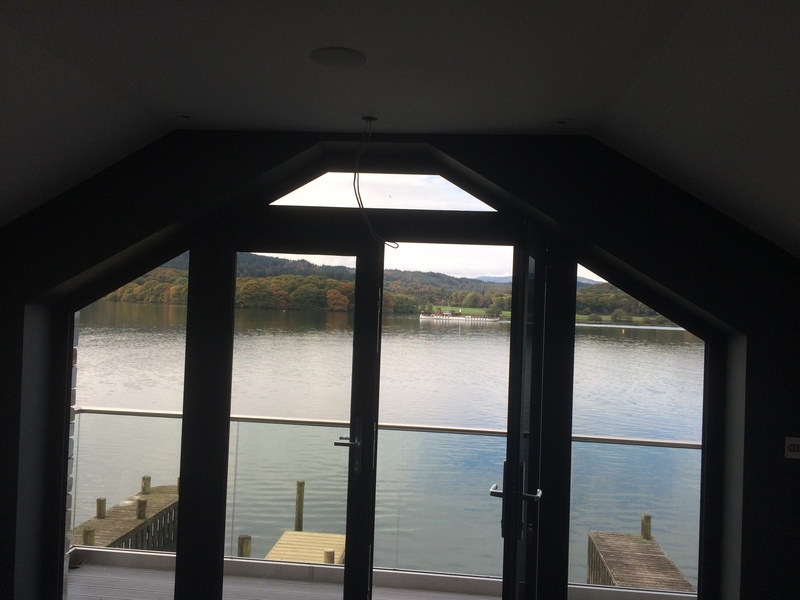 We are involved in a number of prestigious eco developments from Sheffield to the Lake District. We are based in Ripon, North Yorkshire, however, we cover the whole of the North of England and even into north Wales. I class the north of England as anywhere north of Watford gap, up to the Scottish Boarders , west into North Wales and the east coast of England. This is a vast area, however, although we are a relatively small company we can generally ensure that we can meet the demands of our clients within a weeks notice period. We even try to maintain an element of spare capacity which allows us to react to any last minute bookings. Obviously it is beneficial to contact us at an early stage of your build as this allows us to offer you our free advice so you can adequately prepare for your air test throughout the period of your build. However, in reality the air test is often something people only realise they need at the last minute. If this applies to you please don’t panic. just make contact with us and we will send you our air test check list, we are also very happy to offer you guidance and advice on the telephone. Both the air test check list and the advice are free so take advantage. We are committed to providing a first class customer service where we guarantee that you will receive your air test certificate on the same day as the successful air test. We provide on going support and advice throughout your build project (free advice). We don’t sub contract our air testing work. when you book the air test it will be one of our test engineers that will carry out the air test. We will work with you on the day of the test and if necessary will either offer advice regarding any remedial work should the desired score not be achieved. We will also carry out additional permanent sealing during the test to help achieve a pass. We will definitely not cheat to get you through your test but we will endeavour to ensure you are provided with the appropriate advice/solutions to ensure a successful retest. We are a family run company and we care about what we do. This is reflected in or working relationship with our customers. Tips from : Air Testing Leeds. Involve us at planning stage and we can advise on both air tightness and ventilation. Remember to look at our top tip page on the website. Make sure you download out air test check list. When building a self build or a multiple plot development attention to detail is essential. Call us if you need any advice, its free. To optimise our SEO we need to use the Air Testing Leeds at least three times in this post. There has been quite a controversy about building new homes in the Greater Manchester area and there have been several items on the local news about it. Its amazing how many people object to having new housing estates built near where they live. I can sort of understand it, if you are overlooking green fields and your beautiful view is going to be spoilt, however, some of the footage I have seen on TV has been of residents complaining whilst stood in the gardens of their relatively new homes!! Seems a bit hypocritical to me. However, it is also quite puzzling why there are still so many brown field sites all over the Greater Manchester area, I see it all the time when out air testing in the region. Why can’t these be developed instead of digging up the green belt? We have a very competitive pricing structure which is flexible enough to appeal to the one of builder and the larger house developer who is requiring multiple tests per site visit. We are also accredited to test/certificate your ventilation system. Tips from : Air Testing Stockport. To optimise our SEO we need to use the Air Testing Stockport at least three times in this post. 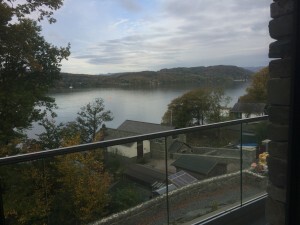 I was in the lake District National Park last week testing a fantastic eco home. The house was built on a disused railway siding near Broughton in Furness. 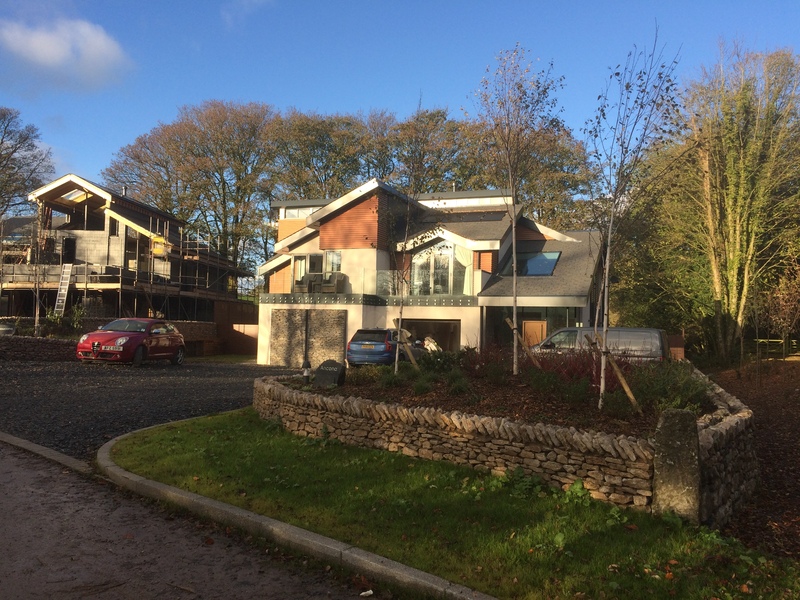 The developer had wanted to build an eco house on a plot behind his existing house, but from what I gathered during the time I was on site this was not an easy project. The main issue appears to have been with the local planning authority and secondly building contractors not wanting to work outside their comfort zone. The house achieved an air test score of a fraction over one, which is almost to passive standards. What was impressive, was that this was a traditional block built house and not a timber frame house which generally perform better. Credit needs to go to the developer who was very fastidious throughout the build process and this was almost certainly why there were issues with the building contractors. We are always saying that its not difficult to build air tight houses but you wouldn’t think so when you see some of the things we see. Basically what this developer did was ensure that there was no penetrations through the internal plaster board and where this was unavoidable he ensured that the holes were immediately sealed. Yes you can drive your building contractors mad by maintaining a tight control of the building project and keeping a close eye on them, but it pays off in the end. This developer had his issues and once he realised that his chosen contractor was not delivering the quality and attention to detail that he wanted, he sacked them. It seems a bit harsh, but if you want to build an eco house, that attention to detail is everything. 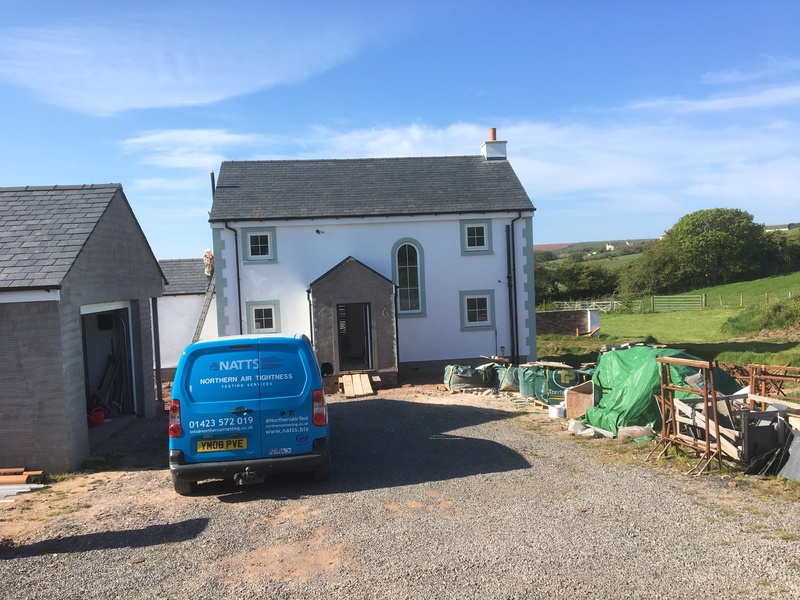 My advice when you are choosing your contractors is to be very clear about what your end goal is and if you are building an eco house, make sure your chosen contractor is clear about what this involves. Use our check list as an example and give a copy to all the trades that you employ. Don’t assume that they understand what an eco house is or that they understand the principles of air tightness. Hold back a percentage of their invoice (be clear that you are going to do this) until after your air test, we will be able to identify where there are issues and usually we can pinpoint the responsible trade. This will ensure that the checklist is adhered to and not just left on the dashboard of the builders van. Tips from : Eco House Air Testing. Check out our top tips page and down load our air test check list. Give each trade a copy of the check list. If you are going to project manage the build be fastidious and be clear about you end goal. To optimise our SEO we need to use the Eco House Air Testing at least three times in this post. Northern Air Testing is an ATTMA authorised air testing company. I have been blogging about air testing and our services for over a year now and I still have loads to talk about, however, this blog is going to be slightly different. We were approached, by the company that look after our PA services, wanting a photo of myself and fellow director Mike as they were going to do a social media post about their services and how they assist us in delivering our service. This got me thinking and I realised that we are almost faceless on our website, so here is a blog about us, and a mug shot of both Mike and myself. History of Northern Air Testing. 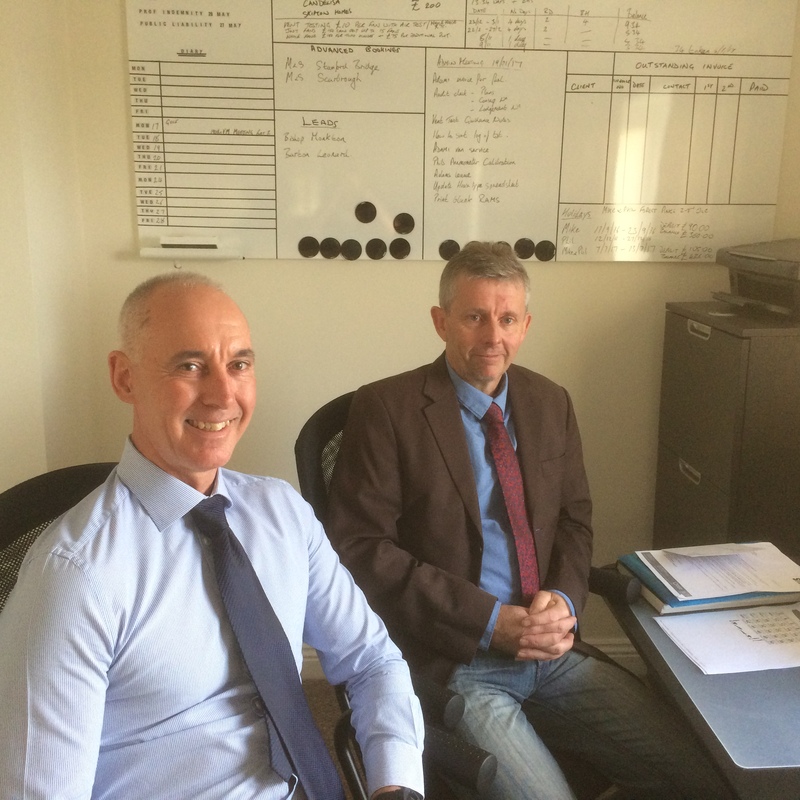 Mike started the business eight years ago as a sole trader and predominately sub-contracted his services to one company who specialised in SAP work. He supplemented this work with the odd individual job else where. This worked well for a number of years and his work steadily increased. Then about three years ago he got to the point where there was too much work for him to realistically cope with. The company he subbed to suggested that he might need to either take someone on or they would sub some of the work else where. We were traveling down the motorway on the way to our annual golf break, Mike mentioned his situation and we were discussing what he might do. I suggested that I join him as I needed a change in direction following some health issues. I was due to take early retirement anyway, but wanted another challenge, rather than just putting me feet up. So the discussions went from there and as they say ”the rest is history” Well it was not quite as simple as that but that’s another story. We are now a limited company with Hannah in the office and our newest recruit Adam, working as an air tester. We no longer sub contract to the original company (another long story) but have tripled our original turnover compared to when we subbed to them. 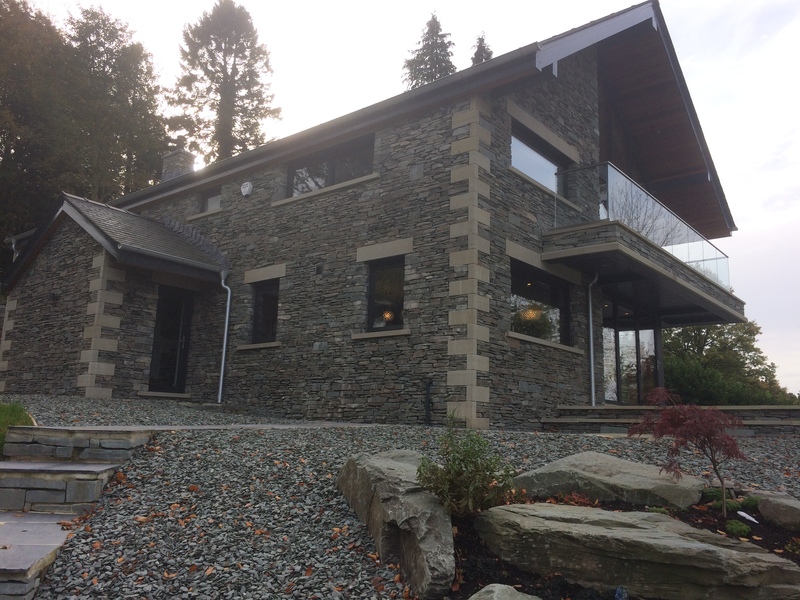 We have established a fantastic working relationship with our customers who range from large national house builders to individual self builders. We pride ourselves in providing a first class customer service at a competitive price. We are happy to offer free advice and have a team working ethos with the companies and individuals that commission our service. Tips from : Air Testing Introduction. To optimise our SEO we need to use the Air Testing Introduction at least three times in this post. We have been involved with a number of developers who have been trying to build housed that score below .6 on their air test. 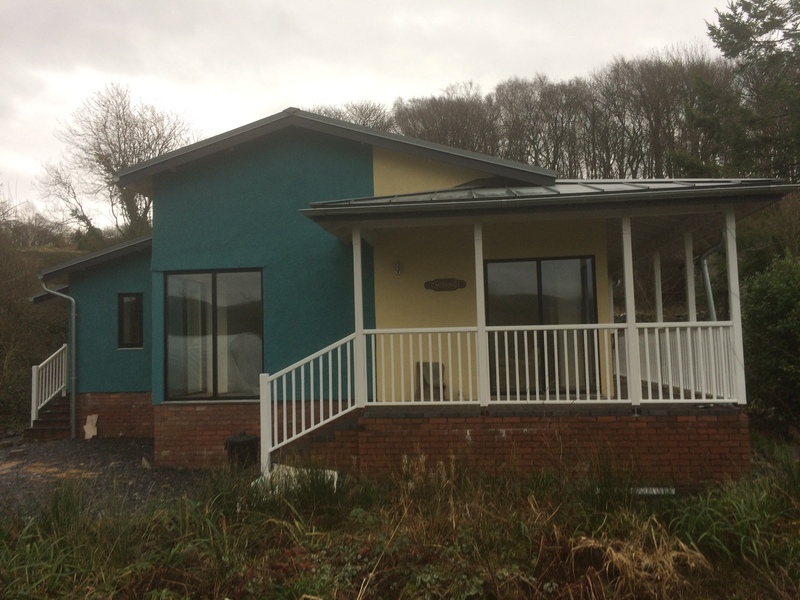 They are not part of the Passivhaus accreditation scheme but are attempting to build ultra-low energy buildings with a target of achieving an A rating on their EPC. Our experience so far, has been that they have struggled to achieve this for a number of reasons. One of the main ones is that they have relied on having only one air test and this has taken place far to late in the build process. Consequently it has either been impossible to identify where weak areas in the building fabric are, or identified weak areas are, either difficult to get at/expensive to rectify. If you re planning to build a low energy or passive house, then you really need to have a minimum of two air tests. The first one should take place once the external fabric of the building is up and water tight. This should include windows and doors. The External fabric of the building is your first line of defence and you need to make sure the penetrations in the fabric of the building are kept to a minimum. The obvious ones are were services enter the building or where your extraction/heat recovery vents. The less obvious areas are where windows joint to the walls or in the case of timber frame/SIP houses, where each panel is joined or where a chimney penetrates the roof. An air test at this stage should achieve very near to the desired end result. However, if it fails to achieve a good score it is easier to identify and rectify any areas of weakness and re-test prior to proceeding with the build. So why a second test? Well you need a final test to produce your air test certificate which should only really be done once the house is habitable. Secondly it ensures that your build continues to achieve the desired score, after all its not all about getting the certificate, its about building an energy efficient home. We have talked about the external skin of your build and the importance of this first line of defence. However, your internal skin is equally important and acts as the second line of defence. It is important to continue to follow the same principles as above and ensure that there are no penetrations in the internal skin. This ensures that if there is a breach in the external skin then the leak will be contained within the cavity. What is the essential ingredient of building a low energy/passive house? Well I think it is as basic as attention to detail. A great example of this was a new build church hall that we tested last week in Harrogate. The hall was built by the parishioners on a voluntary basis for no pay. Once the church had gained planning permission they utilised the existing skills of the parishioners and basically built the hall themselves. Their target air test score was below three but they wanted to achieve below 1.8 to gain an A rating on their EPC. So right from the start of the build they had energy efficiency and the air test in mind. We carried out our a free pre test site visit three weeks before the actual air test. We agreed that we would do an initial test once the windows and doors were in. On test day we arrived to be greeted by a number of the work force who were all very interested in what was about to happen. There was a mixed atmosphere of excitement and trepidation, these people clearly cared about their building. We were shown around the build by the site manager who explained how they had prepared for the test and what they had done in an attempt to build an air tight building. He was however, still anxious about the outcome of the test. Once we had set up our equipment I turned on the fan to begin the depressurisation process. It immediately became apparent that this was going to be a good air test score. Once we had gone through our series of pressures we were amazed to find that the final air test score was an incredible .2. We have never had such a low air test score and to be quite honest we were having some doubt as to whether our equipment was working properly. Needless to say that after carrying out the necessary checks on our equipment we confirmed that the score was correct. So if you want to achieve Passive house standards of air tightness just do what the parishioners did and be ultra conscientious throughout your build and get everyone on board with this. Tips from : Passive House Air Testing. Have a minimum of two air tests. The first one at watertight stage. Maintain attention to detail and seal any penetration in the plasterboard. 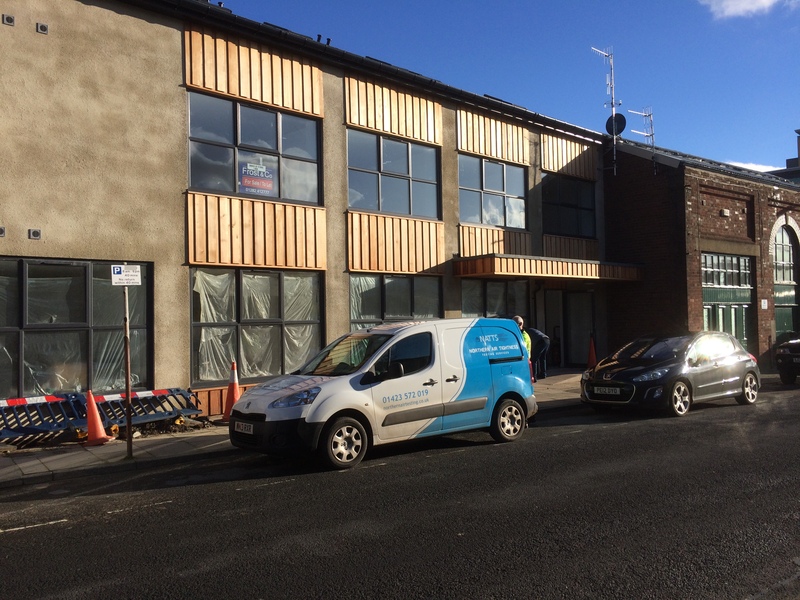 To optimise our SEO we need to use the term Passive House Air Testing at least three times in this post. We have been in Derbyshire this week testing a sample of apartments in Derby city centre. We have tested quite a lot of apartments over the past two or three weeks in various locations around the north of England. Its probably worth discussing the common issues associated with air tightness in apartment blocks. Depending on which floor they are located it can make a dramatic difference to the success of an air test. Lets take the example of a three story apartment block built on a solid concrete slab and first and second floor concrete flooring. The ground and first floor apartments are essentially sandwiched between concrete, so the only potential for air leakage is through the walls or if the concrete has been penetrates to accommodate any services which is unlikely. As long as the developer ensures that the walls are not penetrated then these apartments tend to perform very well with their air test. So lets take a look at the top floor apartment. It has the concrete floor but more often than not it has a traditional lofted space above a plasterboard ceiling. We find that top floor apartments nearly always perform poorly compared to lower floor apartments. Why is this? Most air leakage comes from the cavity behind the plasterboard where it has been penetrated and not sealed or where it falls short of the floor. So on the lower floors the concrete floor and ceiling prevent much of the cold air getting behind the plasterboard and as long as any penetrations through the walls have been sealed, there is little opportunity for cold air to enter this space. The top floor apartment, however, also has the cold roof space above it and therefore is almost entirely (except for the floor) surrounded by cold air. The cavity behind the plasterboard is essentially open at the top where it meets the roof space. Additionally there will almost certainly be a loft hatch, spot lights and ventilation system penetrating the ceiling. It is amazing how many developers do not realise the potential weakness of top floor apartments. We have tested apartment blocks where the lower floors have been consistently getting scores below three and then tested the top floor apartments and they have struggled to get below six. Its really simple. Make sure you treat each room as an air tight plasterboard box and if there is a penetration in the plasterboard make sure it is sealed up. Seal the bottom of the plasterboard, especially behind kitchen units and baths. Make sure you fit a quality loft hatch and make sure the surrounding architrave is sealed as per the tops of skirting. If you have a heat recovery ventilation system installed make sure the ducting is sealed where it penetrates into the roof space (this is one of the biggest areas of air permeability. If it is a relatively small apartment try to avoid using spot lights set into the ceiling or if you do, use bathroom rated ones with the glass vapour cover as these tend to leak less. Tips from : Air Testing Derbyshire. beware of top floor apartments as they often perform poorly, take extra care with the sealing up. To optimise our SEO we need to use the term Air testing Derbyshire at least three times in this post. 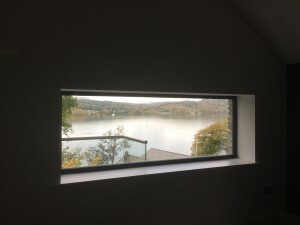 We have been back in the Lake District this week testing on a fantastic eco development by Egg Homes. They are building 22 individually designed homes to a fantastic standard. We have already tested two of the house and they are brilliant, both in how they look and how well they do with their air tests. The build quality is so good that they have not needed to use any sealants on the internal skin of the build. essentially the external block work windows and doors are the air tight barrier. I have previously talked about the importance of team work and attention to detail in previous blog posts and this development exemplifies this message. I had the opportunity to have a chat with the construction manager, Ashley Reece, when I was on site and was impressed with his enthusiasm for the development. He is clearly committed to building genuinely eco friendly, sustainable homes that will last for generations. Ashley, also took the time to show me how the houses were constructed. (I will do a more detailed blog about this shortly). Sustainability is not just restricted to the homes on this development but also includes the surrounding area and community. Just by talking to the team on site over my two visits I have found out that Egg Homes are supporting a mental health charity (Grow Well) who have been allocated some growing space on site. They are also supporting the local Hincaster Trailway that passes close to the development. I have got to say I have never, been to a site where there is such enthusiasm for the surrounding environment. Tips from : Air Testing Kendal. Team work is essential in achieving your desired air test score. To optimise our SEO we need to use the term Air testing Kendal at least three times in this post. Air Testing The Lake District. If you find yourself on this page, have a read but don’t forget to visit our main site. Well first of all I have to say that this is my favourite house I have ever tested, hence all the photos I have added. 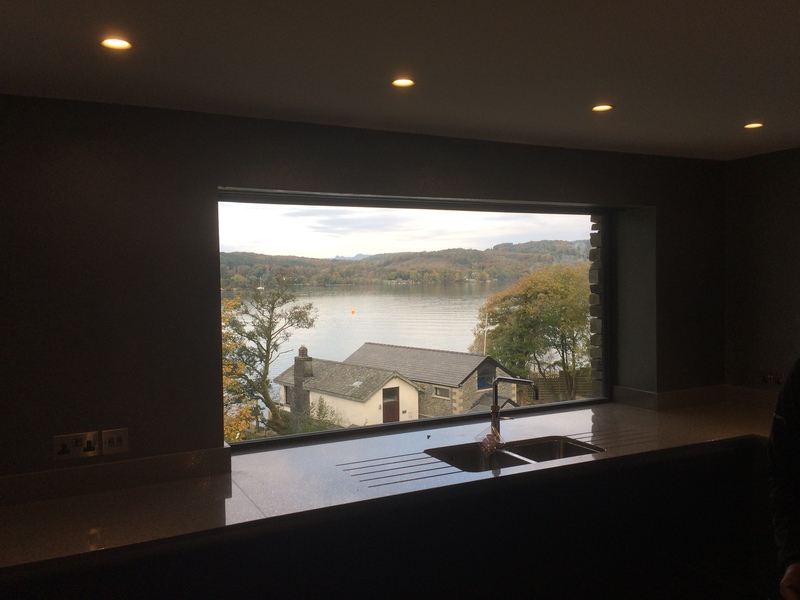 We had a call a few weeks ago from the developer who said we had been recommended by his building control officer from Lakes and Dales Building Control. He said that the house was on the shores of Lake Windermere in Cumbria and said it was stunning. Based on this and the fact that both Mike and myself love the Lakes we decided to double up on this job and make a day of it. When we arrived we couldn’t believe our eyes, what a fantastic location and fantastic looking house. View from the boathouse back to the main house. The house is approached via a long sweeping driveway from the main road above. 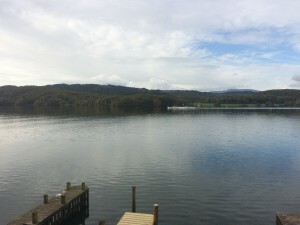 It is set back from the shoreline of the lake by about 50 metres and has sweeping views of not only the lake but of the mountains beyond . 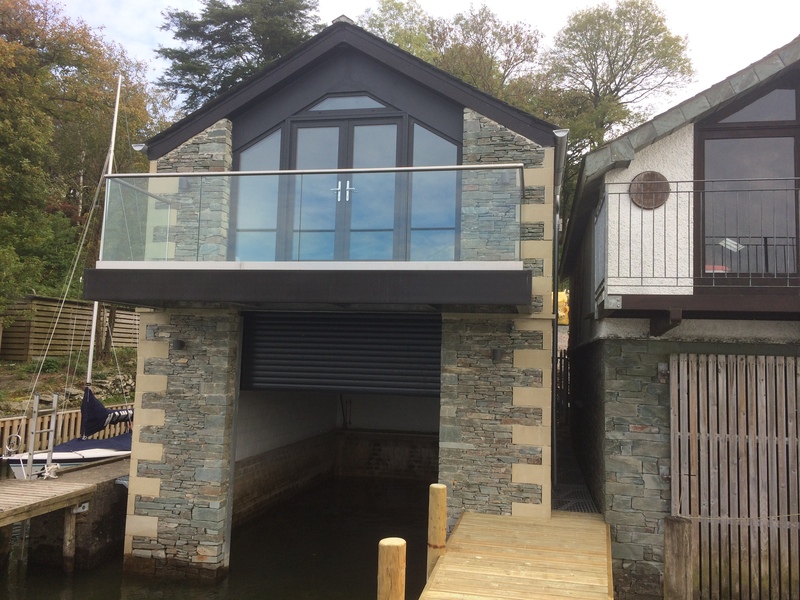 Also in the foreground is the new boat house. View from the master bedroom balcony. Talking about the boat house, just have a look at these pictures, I was even lucky enough to catch one of the two steamers sailing past as I took the photo. (its the MV Tern). 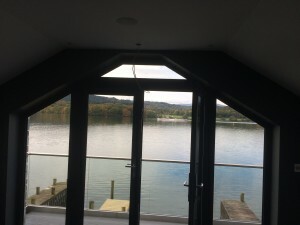 The house was built by Topline Developments and was finished to a very high standard. This high standard was also present in the living accommodation of the boat house and the rooms above the garage. As far as the air testing went, on the whole the house performed well but there were some issues behind the kitchen and utility units. This was where the plasterboard fell short of the floor and was not sealed. If you are familiar with my blogs, you will know all about this issue. If you are not, then download our free check list, as this highlights this and many other areas for consideration. There was also some air leakage from the bottom of all the skirting boards and we have advised the developer to seal this gap with a silicon sealant. Tips from : Air Testing The Lake District. Whether you are building a multi million pound house of something more modest, the principles of building an energy efficient, air tight house still apply. This was a general interest blog but if you would like any advice about our services, please do not hesitate to contact us. Our advice is free. Is this what they mean by a picture window? 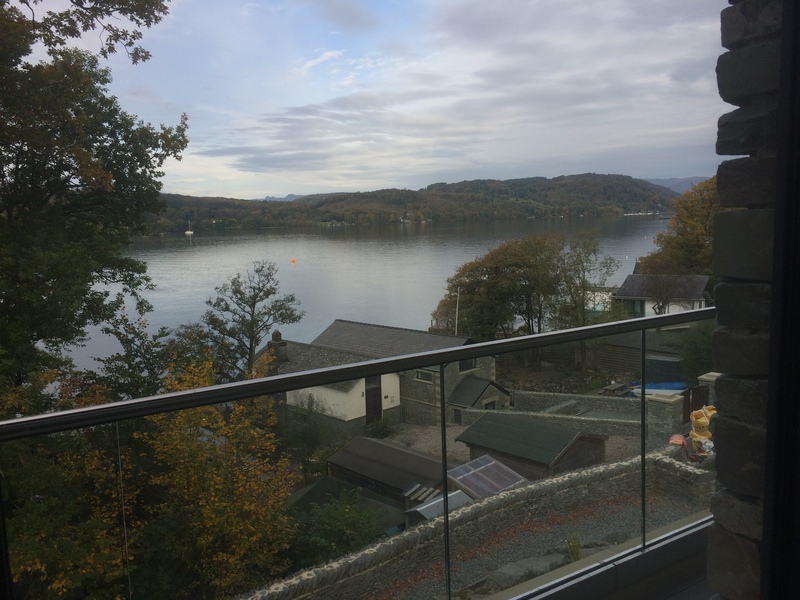 To optimise our SEO we need to use the term Air Testing The Lake District at least four times in this post. 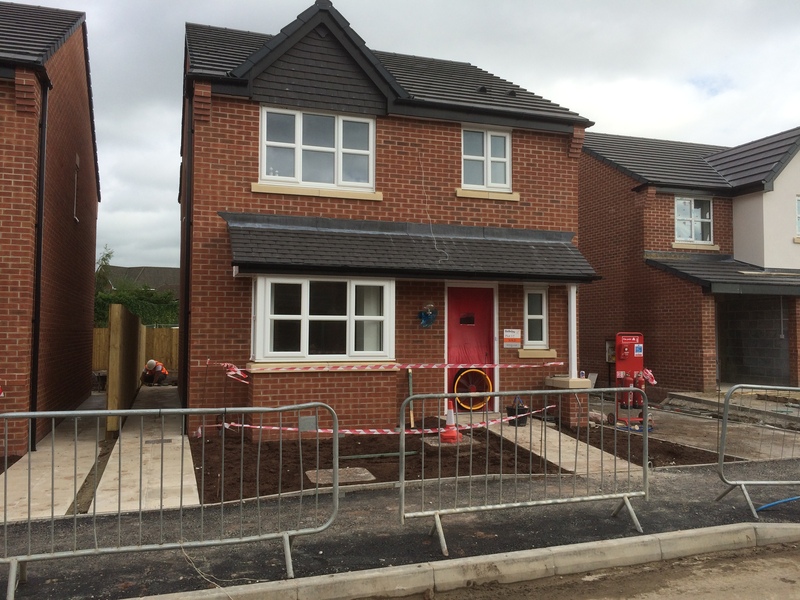 Its incredible how many new homes developments are coming out of the ground in the North West. One of us seems to be testing over there every day. I blame Brexit ”Ha, Ha” Joking aside, things seem to be booming in the building trade and it seem that every corner we turn, there is some sort of new build taking place. This is why we have expanded our team to ensure we can continue to offer a first class prompt service. 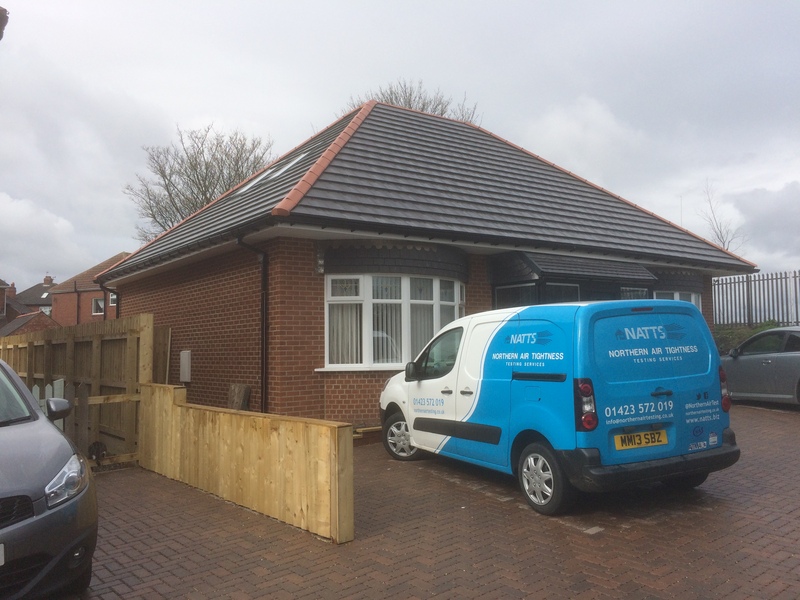 The Job we did in the Greater Manchester was a last minute booking because the developers regular tester was not available, the same happened a couple of week ago with a job up in Durham, (see Adams Blog). This was an unusual job because the building control officer assigned to this development suggested that the previous air test scores on the tested properties were too low ?? and that they should have achieved scores above five rather than the four they achieved. We were asked to come and test the remaining houses and achieve a score above five. This was obviously wrong and therefore we contacted the building control officer in question and had a long discussion about air testing, SAP calculations and ventilation. It turns out that he was a little confused about the relationship between air tightness and ventilation. We were therefore able to test the properties and advise on appropriate ventilation based on the achieved air test scores. 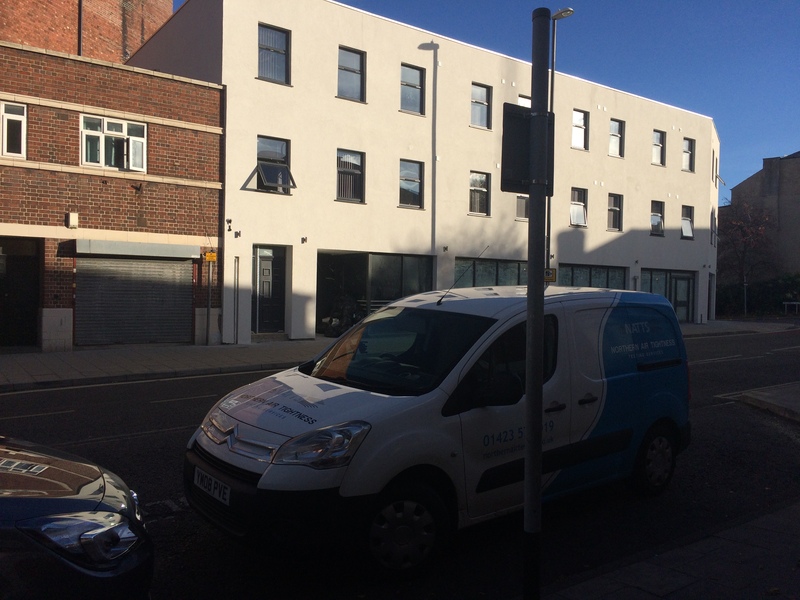 The properties performed very well and were a credit to the developer, its unbelievable that the high quality builds were almost scuppered by a confused building control officer. This highlights the need to consider both ventilation and air tightness at the planning stage of your build. On the back of this job we have been asked to contribute to the developers next development and consult at planning stage. Tips from : Air Testing Greater Manchester. If you need an urgent air test then give us a call and we will do our utmost to fit you in. We will even work out of hours if necessary at no extra cost. We don’t just turn up and do an air test and tell you if you have passed or failed. We are happy to stay and work with your team. We definitely won’t cheat you through your test but we will, within reason, stay and assist you in achieving the desired result. Don’t rely on what your building control officer says, they are generally very good but on occasion can get it wrong. 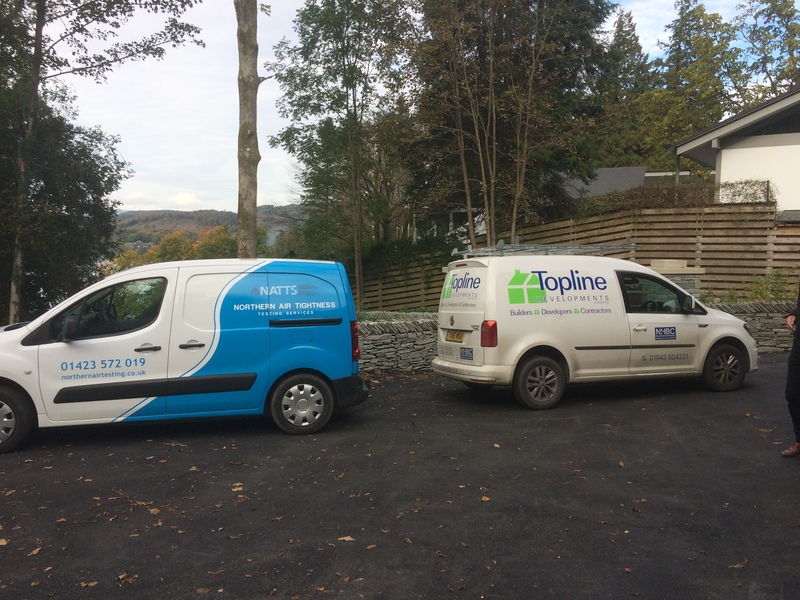 If you have any concerns re the air tightness or ventilation of your property development, give us a call. Our advice is free. To optimise our SEO we need to use the term Air Testing Greater Manchester at least four times in this post.